I was introduced to the Business Model Generation Canvas when I joined the Lifescience Mentoring Network at the BioHub at Alderley Park*. 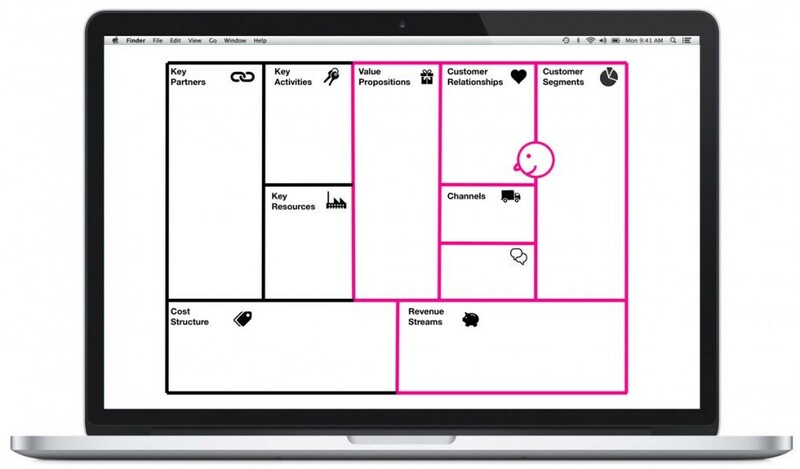 Developed by Alexander Osterwalder among others and part of the Strategyzer series, the canvas clearly lays out the key elements of a business. For me its simplicity is its strength. To be able to look at “all that a business is” on one piece of paper is very powerful. Obviously the primary purpose of the canvas is to create a business model and it’s used at the BioHub to do just that – help start-ups think their business through. The canvas is a not just a useful tool for start-ups though. I’ve used the canvas successfully as a spring board to a marketing strategy for established businesses. A marketing strategy has to lie under a business plan. Understanding the business is vitally important to getting the marketing strategy right. So with the background information on the left in black, the elements of a marketing strategy, on the right in pink, can be built. *Alderley Park is the Astra Zeneca site sold to Manchester Science Parks (MSP) in March 2014. The significant majority of AZ’s R&D activities will be transferred to a new purpose-built global R&D centre in Cambridge over the next few years.